Superheroes are most definitely “in” right now. You just have to look at the schedule for Marvel films over the next few years, the forthcoming Justice League films starting with Batman v Superman, the succession of TV series from Gotham to Flash to Agent Carter… Yep, superheroes are popular. It’s not just films and TV (taking comics as given). The world of books has picked up on the trend and has managed to put its own spin on things. Just looking through my previous reviews, I can see Othergirl and My Brother is a Superhero from the past year – The Black Lotus, too, while ninja-based, definitely has its sensibilities tuned to the superhero paradigm. Last year’s Kelpies Prize winner is Mark Smith’s Slug Boy Saves the World, featuring Murdo McLeod, the world’s worst superhero. So when an author takes on superheroes, they have to do something a little bit different to stand out from the crowd. Which is where Paul Bristow’s The Superpower Project comes in. Originally a shortlisted entry for the 2014 Kelpies Prize (it lost out to the brilliant Lindsay Littleson with The Mixed-up Summer of Lily McLean, so no shame there) the folks at Floris Books obviously didn’t want to let this title slip through their fingers. And she can. How did her Gran know about her superpowers? And what’s she supposed to do with the map her Gran left her? Where did this steampunk robot come from? And what is the sinister Mr Finn doing, setting up strange robotic sculptures all around town? Megan and Cam are launched into a quest to discover the origin of the Greenock superpowers before they can fall into the wrong hands. Fun, excitement, danger and adventure await! Megan is the sensible, no-nonsense leader, while Cam is the comic relief, albeit with hidden depths of his own. The supporting characters, especially Tin Jimmy the steampunk amnesiac robot, are vivid and funny, and Mr Finn the diabolic schemer behind the entire plot is delightfully evil. 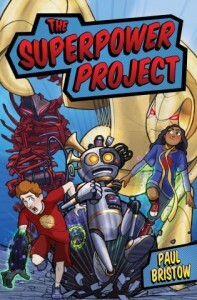 It’s refreshing to have a book set somewhere other than London, New York, Los Angeles or their comic-book analogues – and The Superpower Project uses Greenock and its environs like an extra character. I enjoyed the echo of Iain Banks in the first line, too – Mr Bristow confirmed on Twitter it was a deliberate homage to The Crow Road’s famous beginning “It was the day my grandmother exploded”. You’ll get no complaints from me – my forthcoming short story in Shoreline of Infinity issue 3 is an extended homage to Banks. There are excellent illustrations throughout by Luke Newell, including a short fully-illustrated comic-book prologue, and they complement the book and fit the tone perfectly. The Superpower Project cracks on at a terrific pace, with the battles against transforming robo-sculptures escalating nicely, and the story comes to a satisfying climax with a post-credits scene that sets us up nicely for a sequel. Because this is, like many superhero tales, an origin story – and there’s plenty of scope for more adventures from Megan, Cam, Tin Jimmy et al.